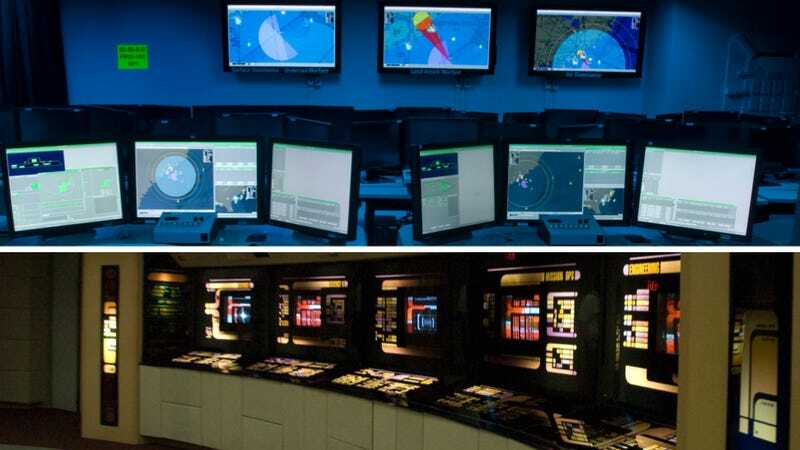 What looks like a miniature version of a war room at the Pentagon or a Combined Air Operations Center (CAOC) near a combat zone overseas, the DDG-1000's Ship's Mission Center may look like its out of the movie War Games but it works in a similar fashion to the bridge seen on Star Trek The Next Generation. Gone are the purpose-built heavy consoles used in a ship's dark and cramped Combat Information Centers (CIC), such as those still found today aboard AEGIS combat system equipped cruisers and destroyers. In their place, the Ship's Mission Center (SMC) will be entirely re-configurable and will feature streamlined consoles and workstations running on an incredibly powerful array of custom-built software and advanced off the shelf hardware. Dozens of individual three-screen work stations, called Common Display Stations, will fill the majority of the Ship's Mission Center, and much like Captain Picard's chair on his ship, commanding officers will have their Common Display Stations built right into their seats. From the SMC's Common Display Stations, the ship's guns can be fired, its sensors slewed, its missiles launched, its radios controlled and the ship's 'signature' profile can be changed. The DDG-1000 can even be steered from the SMC if need be. As a result, there will be no individual radio rooms, gun control stations or other discreet control interfaces that have for over a century been the standard for naval warfare. Like Star Trek The Next Generation's USS Enterprise 1701-D, even the Chief Engineer's station will be located in the SMC during times of combat and intensive operations, not down in the engineering spaces. This is all part of the futuristic destroyer's automated functionality, which allows for a crew size of nearly half that of the smaller Arleigh Burke Class destroyer. The Ship's Mission Center aims to replace the seemingly archaic dark and cramped Combat Information Center concept that is still used by AEGIS capable ships and other surface Navy combatants. The SMC, and the whole ship for that matter, will run on the Linux-based, Raytheon-built, Total Shipboard Computing Environment (TSCE). This is a powerful software and hardware suite that features 16 large hardened, coffin-like IBM blade servers, called Electronic Modular Enclosures, distributed around the ship. These modular super-computing units power the ship's proprietary 'internet.' Because of its open architecture and cloud-like design, every Common Display Station console can be rapidly configured to display anything from weapons diagnostics to sensor pictures and everything in between, once again just like the touch-screen control consoles on the science fiction's USS Enterprise. The Common Display Stations will use regular USB interfaces so that they can be customized for the job at hand, with simpler tasks only needing the station's touch screens, and more complex tasks using track balls, keyboards and styluses. Even wireless devices could one day be introduced to give ship's crew connectivity to the TSCE while they are doing individual tasks and do not have access to a common work station. Under such a concept, a crewman responsible for the ship's vertical launch system (VLS) could get paged by the TSCE when a malfunction occurs, and that crewman will already know exactly what to look for when he or she arrives at the place of malfunction. Even the tools and people needed to fix the issue could be sent to his or her mobile device so that the crewman can page other crewman to grab parts and equipment needed to apply a fast remedy. This graphic shows the Raytheon's Total Shipboard Computing Environment is integrated with the DDG-1000. The DDG-1000, of which only three are planned, will be as much of a data-fusion and command center as another major surface combatant capable of slinging Tomahawk missiles, chasing subs and shooting down aircraft. Because of this, and her unique ability to operate closer to enemy territory than her counterparts, as well as her enhanced survivability when operating as part of a larger flotilla, will see flag level officers deployed aboard her to direct an overall battle plan from the SMC. With this in mind, the DDG-1000's designers included a commanding and flag officer area perched high above and overlooking the multi-level Ship's Mission Center. Up on this VIP balcony of sorts, there will be room for a flag officer to oversea the mission, along with their senior aids, as well as a conference room for rapid collective decision making in private. Large viewscreens mounted on the forward bulkhead of the SMC will display the air, sea and land battle pictures and plans, or other general information, such as streaming video feeds from aerial assets, that commanders want to share to facilitate the crew's collective objective. The fact of the matter is that DDG-1000's automation is not just limited to presenting sensor data and pinpointing mechanical issues. Once again, like Captain Picard's Enterprise, a degree of artificial intelligence can classify, prioritize and ask permission to attack or avoid enemy targets with what the computer thinks is the best possible combat plan. Certain tactical functions, like close-in air defense, can be put on automatic for instantaneous automated decision making in high-threat areas heavy with electronic warfare. Since the ship can also sense the level of threat in its environment by listening for enemy radar and sonar emissions, as well as scanning the skies and seas for potential bad guys, it can figure out what tactics can be used to help evade those threats. This can including jamming, sitting still, or simply presenting a certain angle of the ship to the enemy's most threatening sensors to make itself appear smaller or disappear from the enemy's perspective totally. Alternatively, it can also rapidly come up with solutions to eliminate these enemy threats, turning on its sensors, speeding up and firing off its weapons rapidly in anger. Supposedly, during battle simulations used to test the ship's software and hardware, the DDG-1000's 16 million lines of code were so good at classifying and prioritizing threats in its environment, and making the right tactical decisions in real time based on those threats, that the whole system could be set to fully automatic with positive results. The overall idea behind the Ship's Mission Center, and the Total Shipboard Computing Environment, is that its ergonomics, growth potential and ease of use will have a greater impact on the mission than the sum of its parts. The ease of which the DDG-1000's systems can be upgraded is especially enticing for mission planners. In the past, huge hardware consoles would have to be ripped out of the CIC and replaced with new ones, not just for new capabilities, but for better interfaces with existing capabilities. Then the crew would have to be trained in how to use each individual console. With the Total Shipboard Computing Environment, capability upgrades can be done by plugging in a new system and simply upgrading the ship's software. Interface upgrades can be accomplished through plugging in a new USB device, or possibly in the future, just connecting that device wirelessly to the ship's servers via routers distributed throughout the ship. In the future, if more computing power is needed, the ship's coffin like hardened servers could be simply upgraded with new blade components or totally replaced without effecting the hundreds of common user interfaces around the ship. Redundancy is another positive factor when it comes to the DDG 1000's Total Shipboard Computing Environment, seeing that any station can accomplish any function, if one is lost due to technical failure or damage, another station can instantly take its place. If the SMC is damaged during combat, common workstations on the bridge can take over tactical functions and visa-versa. Also, training is simplified because manipulation of the ship's systems is all software based. In other words, you don't need to train sailors to operate specific consoles and their associated hardware, instead you just train them how to use the new software or capability on the same consoles they have already grown accustomed to. Probably the most forward-thinking aspect about the Zumwalt's brains, user interfaces and innovative control center is that it should greatly increase situational awareness of the crew, and thus increase the effectiveness of the ship itself. By tearing down the hardware, software and space-planning barriers of past purpose-built and cramped Combat Information Centers, the DDG-1000's crew will be able to be more effective at their job via having a clearer picture of the battlespace around them and being able to better communicate and collaborate among themselves. Automation will allow for less 'mental bandwidth' to be used on simply operating the ship and more on how to make it as effective in combat as possible. This should result is smarter decisions being made and implemented faster, which is important considering that this ship is supposed to operate closer to the enemy's capabilities than any other surface vessel. The Navy's newest aircraft carrier, a class in itself, the USS Ford CVN-78, is also being built with the Total Shipboard Computing Environment and there is a good chance that future surface combatants, or even those in need of deep upgrades, could receive a variation of the system. Lockheed also has a competing system based around its proven AEGIS combat systems called Aegis Open Architecture that it hopes to install on future Arleigh Burke Class destroyers. The DDG-1000 Zumwalt Class truly represents one future vision of surface warfare for the US Navy and it packs a serious punch, especially when it comes to attacking an enemy's shore-based assets and capabilities. Still, it is interesting to think that beyond the ship's big rocket assisted projectile slinging 155mm guns, stealthy design, high-end sensors, long rows of vertical launch cells packed with missiles and its top-of-the-line aviation element, the DDG-1000's biggest weapon is its brain and the way in which its human occupants will manipulate it. Now all the DDG-1000 need is a secondary battle bridge and the ability to separate the ship's composite deck house from its main hull for especially dangerous missions... Then again the ability to travel into space would be beneficial too.